Background: To evaluate the diagnostic accuracy of different radiographic methods in the assessment of proximal alveolar bone loss (ABL). Materials and Methods: ABL, the distance between cement-enamel junction and alveolar bone crest, was measured in 70 mandibular human teeth - directly on the mandibles (control), using conventional periapical radiography with film holders (Rinn XCP and Han-Shin), digital periapical radiography with complementary metal-oxide semiconductor sensor, conventional panoramic, and cone-beam computed tomography (CBCT). Three programs were used to measure ABL on the images: Image tool 3.0 (University of Texas Health Sciences Center, San Antonio, Texas, USA), Kodak Imaging 6.1 (Kodak Dental Imaging 6.1, Carestream Health ® , Rochester, NY, USA), and i-CAT vision 1.6.20. Statistical analysis used ANOVA and Tukey's test at 5% significance level. Results: The tomographic images showed the highest means, whereas the lowest were found for periapical with Han-Shin. Controls differed from periapical with Han-Shin (P < 0.0001). 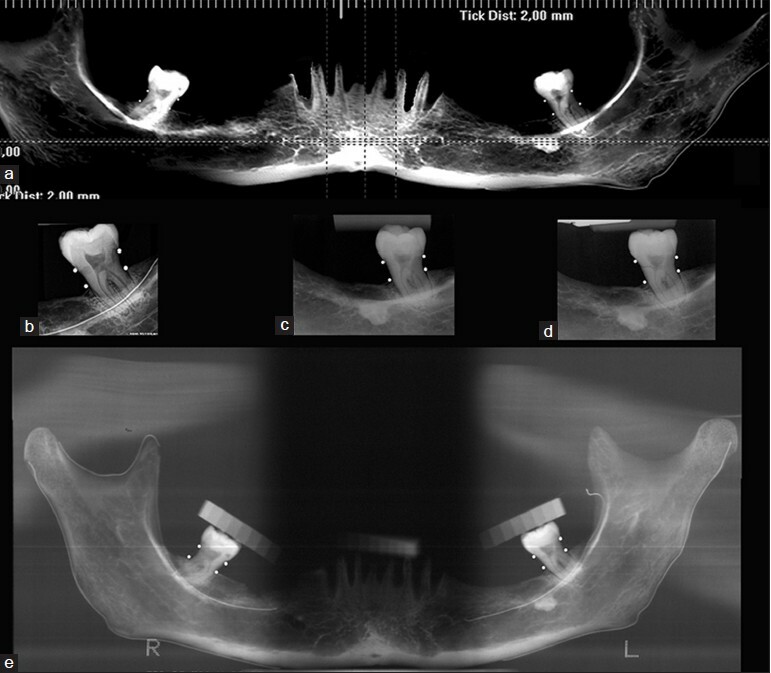 CBCT differed from panoramic (P = 0.0130), periapical with Rinn XCP (P = 0.0066), periapical with Han-Shin (P < 0.0001), and digital periapical (P = 0.0027). Conventional periapicals with film holders differed from each other (P = 0.0007). Digital periapical differed from conventional periapical with Han-Shin (P = 0.0004). Conclusions: Conventional periapical with Han-Shin film holder was the only method that differed from the controls. CBCT had the closest means to the controls. Cone-beam computed tomography, on the other hand, provides images with excellent quality and accuracy, the structures can be seen in three-dimension at any angle, which allows analysis without distortion, and measurement of bone loss even of the buccal and lingual/palatal faces, a possibility not possible with other types of images. , However, du Bois et al. assert that only about 3% of current studies in dentistry examine the applications of CBCT in periodontics. Does CBCT is so many good other image methods? CBCT may be unnecessary for interproximal ABL. The aim of this in vitro study was to evaluate the diagnostic accuracy of conventional periapical radiography taken with film holders Rinn and Han-Shin, digital periapical radiography with complementary metal-oxide semiconductor sensor (CMOS), panoramic radiography, and CBCT in the measurement of ABL. The study was approved by the Institutional Review Board/Independent Ethics Committee of the State University of Maringα (Protocol 0655142.7.0000.0104). The sample consisted of 70 teeth from 10 macerated human mandibles of the university's Department of Morphophysiology Sciences, each mandible with varied number of teeth. The control method of measuring ABL consisted of determining the linear distance between the CEJ and the ABC on the interproximal surface of the teeth (the CEJ-ABC distance), with the use of a digital calliper accurate to 0.01 mm (Lee Tools ® , Rio de Janeiro, Brazil). The experimental methods consisted of measuring ABL using conventional periapical radiography with film holders (Rinn XCP and Han-Shin), digital periapical radiography with CMOS, panoramic radiography, and CBCT [Figure 1]. For better standardization were placed in small metal spheres in the CEJ and another peak of the ABC. Conventional periapical radiographs were obtained using the paralleling technique with Rinn XCP film holder (Dentsply, USA) at a 40 cm focal length, and bisecting technique with Han-Shin film holder (Maquira ® , Maringα, Brazil) at a 20 cm focal length. Particular care was taken in order to minimize discrepancies among radiographs, by standardizing the geometrical projection of the X-rays, the alignment of the images, and contrast and density of the images. The bitewing technique was not performed because ABL was extensive in some teeth and could cut in the image. Digital periapical radiographs were taken with the film holder provided by Kodak RVG 6100 digital radiography system (Carestream Health ® , Rochester, NY, USA). The digital periapical radiographs was measured using the equipment's own software (Kodak Dental Imaging 6.1, Carestream Health ® , Rochester, NY, USA). The files are saved according to the manufacturer's specifications. Panoramic radiographs were obtained with a conventional X-ray machine (Orthoralix 9200 GENDEX, Dentsply ® , Des Plainnes, USA) using Kodak T-Mat G/RA films (15 × 30 cm, Carestream Health ® , New York, USA) with their metallic cassette and intensifying screen (Kodak Lanex Medium Extraoral Imaging Screens X-Omat). Using alignment lights, the mid sagittal plane of the mandibles was positioned perpendicularly to the ground and the occlusal plane parallel to the ground. Calibration of panoramic radiography, conventional and digital periapical radiography was made using an aluminum step wedge (8 steps) with 1 mm increment and 5 mm thickness. Conventional radiographs were processed in an automatic processor (Revell X-TEC, Londrina, Paranα, Brazil). Cone-beam computed tomography images were obtained using an i-CAT scanner (Hatfield, PA, USA). For most favorable detailing of root structures, the study used a 14-bit grey scale, field of view of 6 cm, voxel of 0.125 mm, and 36.2 mAs exposure time. All radiographic and tomographic images were taken by the same operator, a specialist in dentomaxillofacial radiology. The files are saved according to the manufacturer's specifications. File formats were determined by the image generated by the programs, except the conventional radiographs that had to be scanned format, that TIFF considered best for scanned images was used. , We chose to use the best file format and better resolution for each image type. All measurements were made by a single radiologist, experienced with the use of the mentioned programs, a specialist in dentomaxillofacial radiology, and were analyzed again with a 1 week interval between them. Intra-examiner reliability was verified by weighted kappa test (κW ). Intra-examiner coefficient was 0.843, the strength of agreement was very good according Altman  [Table 1], nevertheless the means of these two measurements were used for statistical analysis for greater reliability. Data were subjected to ANOVA and Tukey's test at 5% significance level, using GraphPad Prism 6.0 (GraphPad Software, San Diego, CA, USA) and Minitab 15.0 (Minitab Inc, State College PA, USA). The highest means of VBL were found for the actual measures using the calliper, the control method, and for the CBCT images, whereas the lowest ones values were for the images taken with the film holder Han-Shin [Table 2] and [Figure 1]. Multiple comparisons of means using Tukey's test revealed that statistical differences [Table 3] were between control method and periapical using Han-Shin film holder (P < 0.001), but not between control and the other methods. The results of CBCT were different from those of panoramic radiographs (P = 0.0130), periapical with Rinn XCP film holder (P = 0.0066), periapical with Han-Shin film holder (P < 0.0001), and digital periapical radiographs (P = 0.0027). Periapical with film holders were different from each other (P = 0.0007). Digital periapical differed from periapical with Han-Shin film holder (P = 0.0004). Radiographic examination, along with clinical examination, is essential in the diagnosis of periodontal diseases, in determining their prognosis, and in assessing treatment outcome. ,,, Due to its relevance, this study aimed to evaluate the best radiographic method for measuring ABL. Different from Persson et al. and Langlois Cde et al. who found that periapical radiographs and panoramic images showed similar accuracy, in the present study panoramic radiographs (mean 2.664) were more accurate to detect ABL than periapical using Han-Shin film holder (mean 2.224). However, compared with the control results the panoramic images were close, so indicating the panoramic as an initial test for the evaluation of ABL. In this respect, the authors , agree with results of this research. In this manuscript, CBCT showed the most accurate ABL measurements, not statistically different from the control method. Similar results were found by Raichur et al.,  Vandenberghe et al.,  Grimard et al.,  and Mol and Balasundaram  who compared CBCT images with digital radiography in the detection of intrabony defects. The authors , used two measurements - from the CEJ to the bottom of the bone defect (CEJ-BD), and CEJ-ABC. They found that both CBCT and digital radiography had similar means for CEJ-ABC, whereas for CEJ-BD digital radiography showed a discrepancy of 1-2 mm from the actual means, with CBCT being more accurate to assess BD. Mengel et al. compared different radiographic methods for accuracy and quality of the representation of BDs. They found more accuracy for CBCT, the images in three plans with no overlapping or distortion. The same result found in the present manuscript. Similarly, Georgescu et al.,  CBCT was significantly more accurate than panoramic images in this study. The scholars  evaluated CBCT and panoramic radiography, quantitatively and qualitatively, and concluded that CBCT images were more accurate to evaluate anterior mandibular area. The comparison between CBCT with periapical radiographs showed, again, that CBCT is more accurate in detecting and locating ABL, as de Faria Vasconcelos et al. also found. In contrast, Misch et al.,  who used CBCT, periapical radiography, periodontal probe, and an electronic calliper as the standard reference, found no difference between CBCT and periapical images in the detection of interproximal BDs. However, Misch et al. also found that CBCT, but not periapical radiography, was able to detect buccal and lingual defects. As conventional radiography cannot assess the buccal and lingual surfaces, the present study opted to measure the interproximal surfaces, which allows the comparison among different radiographic methods. Given the present research, it is clear that for interproximal BDs CBCT is not necessary given the fact that other techniques provide satisfactory accuracy except conventional periapical radiography using Han-Shin film holder. 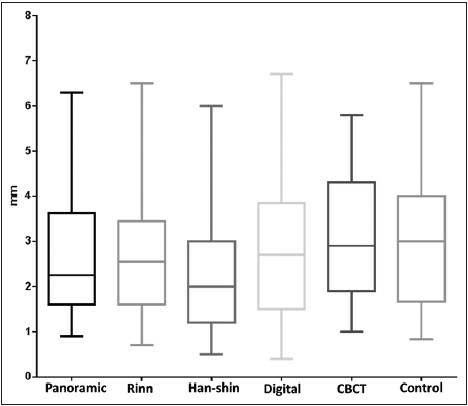 Within the limitations of this study, compared with the control measurements, only conventional periapical radiography using Han-Shin film holder showed significant lower differences, whereas the values of CBCT were the closest to the control method. 1. Hausmann E. Radiographic and digital imaging in periodontal practice. J Periodontol 2000;71:497-503. 2. du Bois AH, Kardachi B, Bartold PM. Is there a role for the use of volumetric cone beam computed tomography in periodontics? Aust Dent J 2012;57 Suppl 1:103-8. 3. Mol A, Balasundaram A. In vitro cone beam computed tomography imaging of periodontal bone. Dentomaxillofac Radiol 2008;37:319-24. 4. Wong BK, Leichter JW, Chandler NP, Cullinan MP, Holborow DW. Radiographic study of ethnic variation in alveolar bone height among New Zealand dental students. J Periodontol 2007;78:1070-4. 5. Raichur PS, Setty SB, Thakur SL, Naikmasur VG. Comparison of radiovisiography and digital volume tomography to direct surgical measurements in the detection of infrabony defects. J Clin Exp Dent 2012;4:e43-7. 6. Corbet EF, Ho DK, Lai SM. Radiographs in periodontal disease diagnosis and management. Aust Dent J 2009;54 Suppl 1:S27-43. 7. Jeffcoat MK. Radiographic methods for the detection of progressive alveolar bone loss. J Periodontol 1992;63:367-72. 8. Greenstein G. Subgingival irrigation - An adjunct to periodontal therapy. Current status and future directions. J Dent Hyg 1990;64:389-97. 9. Mol A. Imaging methods in periodontology. Periodontol 2000 2004;34:34-48. 10. Li G, Engström PE, Nasström K, Lü ZY, Sanderink G, Welander U. Marginal bone levels measured in film and digital radiographs corrected for attenuation and visual response: An in vivo study. Dentomaxillofac Radiol 2007;36:7-11. 11. Mohan R, Singh A, Gundappa M. Three-dimensional imaging in periodontal diagnosis-Utilization of cone beam computed tomography. J Indian Soc Periodontol 2011;15:11-7. 12. Tyndall DA, Rathore S. Cone-beam CT diagnostic applications: Caries, periodontal bone assessment, and endodontic applications. Dent Clin North Am 2008;52:825-41. 13. Wolf B, von Bethlenfalvy E, Hassfeld S, Staehle HJ, Eickholz P. Reliability of assessing interproximal bone loss by digital radiography: Intrabony defects. J Clin Periodontol 2001;28:869-78. 14. Persson RE, Tzannetou S, Feloutzis AG, Brägger U, Persson GR, Lang NP. Comparison between panoramic and intra-oral radiographs for the assessment of alveolar bone levels in a periodontal maintenance population. J Clin Periodontol 2003;30:833-9. 15. Ordinola-Zapata R, Bramante CM, Duarte MH, Ramos Fernandes LM, Camargo EJ, de Moraes IG, et al. The influence of cone-beam computed tomography and periapical radiographic evaluation on the assessment of periapical bone destruction in dog's teeth. Oral Surg Oral Med Oral Pathol Oral Radiol Endod 2011;112:272-9. 16. Bissoli CF, Takeshita WM, Castilho JC, Medici-filho E, Moraes ME. Digitalization of images in radiology: A new vision of future. Rev Odonto 2007;30:34-9. 17. Gonçalves A, Nicoli GA, Zamperini CA, Hebling J, Gonçalves M. Effect of digitization parameters on periapical radiographic image quality with regard to anatomic landmarks. Rev Odontol UNESP 2011;40:25-9. 18. Dove SB. UTHSCSA ImageTool: Version 3.0 Final is here. Available from: http://www.compdent.uthscsa.edu/dig/itdesc.html [Last accessed on 2014 Jan 27]. 19. Takeshita WM, Vessoni Iwaki LC, Da Silva MC, Filho LI, Queiroz Ade F, Geron LB. Comparison of the diagnostic accuracy of direct digital radiography system, filtered images, and subtraction radiography. Contemp Clin Dent 2013;4:338-42. 20. Gürdal P, Hildebolt CF, Akdeniz BG. The effects of different image file formats and image-analysis software programs on dental radiometric digital evaluations. Dentomaxillofac Radiol 2001;30:50-5. 21. Lund H, Gröndahl K, Gröndahl HG. Cone beam computed tomography evaluations of marginal alveolar bone before and after orthodontic treatment combined with premolar extractions. Eur J Oral Sci 2012;120:201-11. 22. Forsberg J, Halse A. Radiographic simulation of a periapical lesion comparing the paralleling and the bisecting-angle techniques. Int Endod J 1994;27:133-8. 23. Altman DG. Practical Statistics for Medical Research. London: Chapman and Hall; 1991. 24. Hayashi MM, Issa JP, Tiossi R, Pardini LC, Watanabe PC. Evaluation of the use of film holders by undergraduation students. Int J Odontostomatol 2007;1:109-14. 25. Rushton VE, Horner K. A comparative study of radiographic quality with five periapical techniques in general dental practice. Dentomaxillofac Radiol 1994;23:37-45. 26. Coelho RM, Sumas KS, Oliveira-Júnior IS, Manzi FR. Comparison of radiographic film holders considering periodontal aspects. Periodontia 2007;17:80-5. 27. Langlois Cde O, Sampaio MC, Silva AE, Costa NP, Rockenbach MI. Accuracy of linear measurements before and after digitizing periapical and panoramic radiography images. Braz Dent J 2011;22:404-9. 28. Vandenberghe B, Jacobs R, Yang J. Detection of periodontal bone loss using digital intraoral and cone beam computed tomography images: An in vitro assessment of bony and/or infrabony defects. Dentomaxillofac Radiol 2008;37:252-60. 29. Grimard BA, Hoidal MJ, Mills MP, Mellonig JT, Nummikoski PV, Mealey BL. Comparison of clinical, periapical radiograph, and cone-beam volume tomography measurement techniques for assessing bone level changes following regenerative periodontal therapy. J Periodontol 2009;80:48-55. 30. Mengel R, Kruse B, Flores-de-Jacoby L. Digital volume tomography in the diagnosis of peri-implant defects: An in vitro study on native pig mandibles. J Periodontol 2006;77:1234-41. 31. Georgescu CE, Mihai A, Didilescu AC, Moraru R, Nimigean V, Nimigean VR, et al. Cone beam computed tomography as a method of quantitative and qualitative analysis of alveolar crest in the frontal mandibular area. Rom J Morphol Embryol 2010;51:713-7. 32. de Faria Vasconcelos K, Evangelista KM, Rodrigues CD, Estrela C, de Sousa TO, Silva MA. Detection of periodontal bone loss using cone beam CT and intraoral radiography. Dentomaxillofac Radiol 2012;41:64-9. 33. Misch KA, Yi ES, Sarment DP. Accuracy of cone beam computed tomography for periodontal defect measurements. J Periodontol 2006;77:1261-6. 2 Are dental and jaw changes more prevalent in a Brazilian population with sickle cell anemia?